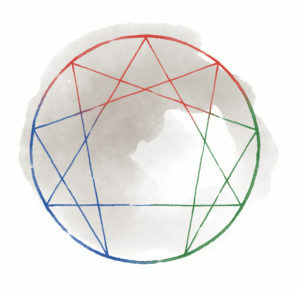 For everyone who has done any in-depth work with their Enneagram type, it is probably obvious that the language used to describe the Enneagram of Passions has always seemed inadequate and sometimes downright clumsy. 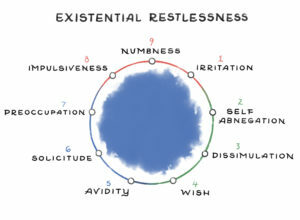 The rendering of the Passions is at the heart of the Enneagram of Personality—in fact, the Enneagon of Passions was among the original nine of Óscar Ichazo’s 108 Enneagons that were first taught in the late 1960s and subsequently let loose into the world after Claudio Naranjo and his students parsed them out into Ennea-Types during the early 1970s. Without disputing the traditional understanding of the relationship between the Enneagram’s Virtues and Passions or their location in the Heart Center, it seems there is a long-overdue opportunity to provide a more refined approach to exploring the contours of the Passions. I understand the Passions to be our ego’s basic coping tool to reconnect with essence, the most rudimentary contrivance we instinctually appeal to in our unconscious attempt to find our way home. The Passions could be viewed like a small keychain flashlight used while lost in the middle of a forest. Though it may seem helpful because of the brightness of a simple light in the darkness, it is still an entirely inadequate lifeline. Today the Passions are a central element of nearly all serious Enneagram studies. Though they stand alone as some of the clearest archetypal components of human character structure, the language used to define the nine capital sins ascribed to the Enneagram’s Passions is imprecise at best. Second, I don’t believe the Passions are first and foremost “sins” nor the shape of one’s tragic flaw, as often purported by those Enneagram students influenced through the Jesuit lineage. I think Claudio Naranjo’s interpretation of the Passions as a “thirst for being, ultimately based on a loss of contact with Being” connected to our original wound and our loss of innocence, seems as true to experience as any explanation. Certainly, when the Passions are overused as egoic coping mechanisms, they quickly become addictions, and in addiction sin can be present. Third, I was at a recent workshop facilitated by Michael Goldberg where he shared the story of a conversation he had with Óscar Ichazo back in the early 1990s. During one of their discussions, Ichazo expressed his curiosity about the dogmatic inflexibility of people who rigidly use his traditional terms for the Passions without reflecting on the meaning behind the words. Considering he was working in his second language to portray such a profound teaching, Ichazo mentioned to Goldberg that the English translation for some of the terms used with the Passions was insufficient, only an impression of what was meant by the substance of the Passions. I’m convinced the triadic cosmology of the Enneagram is its strongest proof. Like a fractal that shows a naturally occurring infinite pattern replicated in a feedback loop, the hidden dimensions of the Enneagram come forward through its triads. It’s much like the old pixelated “Magic Eye” images that disguise a 3D figure in a two-dimensional pattern. The harder you focus your attention to see the 3D picture emerge, the more difficult it is to see it. You have to unfocus or relax your gaze to allow the embedded image to be revealed. It’s very similar to the work we’re all invited to when facing our Passion. Focusing on the shape of the Passions only gives them more power. It’s when we breathe into them with our whole selves that they are revealed for what they truly are. This helps us own them, integrate them, and make peace with them—finding the humor in the humility of our humanity. 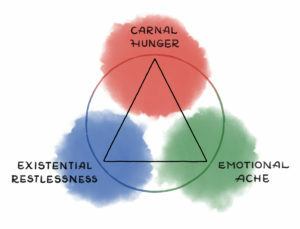 It seems the way most of us experience the Enneagram’s Passions is triangulated in each of the three Intelligence Centers—a sort of cocktail or soup merging the three distinct ways the Passions are internalized. I elect to scrutinize the Passions through the lens of the Intelligence Centers since our Center is our primary mode of perceiving ourselves in reality. But we must remember, the Centers simply represent organs of perception or processes of translating experiences on an essential human level. Integrating what’s been disassociated from our three Intelligence Centers and confined to the soul’s thirst for being, it seems the Passions take on a three-dimensional clarification when seen as an aggregate of a carnal hunger (held in the Body Center), an emotional ache (experienced in the Heart Center), and an existential restlessness (cerebralized in the Head Center). Any combination of two of these ingredients generates the third expression or attribute of the Passion. Even more, the way we delude ourselves based on how our Passion creates addictive patterns for us is primarily experienced in our dominant Intelligence Center. At the same time, our repressed Center is where our Passion hides itself from us (a blind spot of sorts) and causes us our deepest pain and most dramatic struggles. The repressed Center, our most unconscious process of perception, then becomes the incubator of experience that gives the Passion its strongest grasp on the ego. The challenge is to learn to recognize how we experience our Passion in each of our Centers so that when one driving force takes over the other, two can hold it accountable. Overlaying the nine traditional Passions of the Enneagram with each of the Intelligence Centers offers accuracy, clarity, and candor. If we can truthfully admit to ourselves what we’re contending with, then we know how to face, accept, and make peace with the sometimes-painful layers of the Enneagram’s Passions. While exploring this theory, I called a friend who is dominant in type Five and asked him how he has related to his type’s traditional Passion, avarice. He immediately protested the assumptions around its notions of greed and offered a detailed clarification of how he experiences this thirst to reconnect with his essential nature. Let us explore these distinctions in each of the nine types. Type One: Traditionally, Óscar Ichazo assigned anger as the Passion for type One. This is perhaps better described in its relationship to the frustration of the One’s Fixation (resentment). For many Ones, the anger they experience is ironically located in feeling misunderstood that their Passion isn’t merely unfathomable rage. It is better explicated as the exhausting exasperation carried in their bodies. When amalgamated with an emotional state of indignation, Ones’ idealism begins to fade and turns in on themselves, creating deep and even sometimes somatic pain. Having repressed their Head Center, the obscuring of this exasperated indignation leads to a persistent mental irritability or irritation expressed through fussiness and frustration, sometimes coming out as anger, but that only as a representation of what they truly are experiencing in their bodies. Type Two: Pride is an unfortunate description of type Two’s Passion since people dominant in type Two rarely come across as arrogant, conceited, or any other overt form of pridefulness. False humility, a cousin of pride, gets closer to the meaning implied, though this still is inadequate. Two’s denial of their own needs is held in their body as a way of diminishing wants or desires, yet they can’t help but crave for these denied desires to be met. This leads to passive-aggressive presumption. Presumption that others would mirror back to the Two what they are offering of themselves is a common expression of the pain they feel. “You could have expressed your gratitude more explicitly” or “Why didn’t you think I would have liked to join you?” are emblematic ways Twos express their pain. Presuming is also commonly hidden in the assumption that if they did make their needs known—or even more difficult, if they actually asked that their needs be met—they would only experience rejection. The Two presumes initiative from those whom they most desire to meet their needs, all the while convincing themselves that when their needs aren’t met they’ll be fine. Self-abnegation is the mental diminishment of the inner repression of these desires, convincing Twos to give away more of themselves at their own expense. And since the Two’s repressed Center is in their mind, self-abnegation shapes the notion of pride more than the other two aspects. Type Three: How shaming must it be for those dominant in Type Three to have to reconcile the traditional Passion labeled as deceit. Their preoccupation with authenticity fortifies an internal dilemma that seems to be fixed on an inescapable pendulum swing between deception and integrity. Type Three metabolizes this ever-present duplicity in their bodies by eluding its need to be faced and interrogated for what’s instinctually behind it. Their psychological ability to evade deception merely serves to give it more power over them. Aching this disconnect, Threes’ repressed Heart Center can’t bear to face yet another inner imperfection that could be viewed by others as a conscious blemish, so type Threes’ subtlety refines their deceptions by over- or under-exaggerating them in socially passable transmissions. In this way, they hope to be seen as more legitimized than they really are. Not entirely feeling the impact of their pretenses, Type Three dissimulates consequences by mentally dissembling the image projection of what they won’t or can’t be truthful about. Type Four: Among the most misunderstood of the Enneagram types, Fours suffer the marginalization of what’s misunderstood by them and about them. This has given their traditional Passion’s notion of envy a fraternal relationship to jealousy, but it’s a much more delicately nuanced struggle than mere enviousness. The physical experience of envy may be more akin to a somatic yearning held in the bodies of those who feel more uniquely complex than simple personality descriptions can caricature. In repressing their Body Center, this yearning is felt as hunger that their abandoned hearts sense must be starved, lest it becomes too strong of an internal driver. Translating the world through an emotional sense of abandonment—both self-abandonment and their unconscious attempts to be or feel abandoned by those in their lives as the confirmation bias of it—those dominant in type Four mentally experience this convoluted sense of envy as ethereal wishing. This is the gentler side of their impassioned longing for what they assume to be more significant than what their current quality of being offers. Type Five: The notion of avarice or greed is a poor grasp at the overdriven collecting tendency of those dominant in type Five to overcorrect for an emptiness or carnal hollowness of scarcity that they often experience. This rapacious need to acquire analysis, the correct questions, time and space for research, or a theoretical framework for understanding is a substitute for physical hunger felt in the bodies of Fives. Having repressed their Body Center, the experience of acquisition seems to get closer to what is typically meant by the traditional Passion, avarice. Feeding this acquisitive hunger supports the sequestering of the Five’s heart by their mind, a handing over of their emotional self to their mental faculties as a way of managing their distrust of their feelings, which must be accountable to their cerebral aptitudes. Once their hearts are sequestered, the self-isolating tendency of the Five is given over to a voracious avidity, their eagerness to consume and connect all things. Type Six: Archetypal threat-forecasters, the overidentification of Sixes with fear fails to explain how doubling down on what they are concerned about is actually a way they care for people in their lives—as if they have to face our fears for us by internalizing all that could go wrong. Carrying this burden in their body, those dominant in type Six experience a physical pull in two simultaneous directions: suspicion for all that is even microscopically off, and a visceral sense of fret that feels like an inner gnawing of unfortunate possibilities. The pain of all this gets parked in the Heart Center and is a repetitive compulsion for self-doubting, a form of questioning their own veiled safety nets as a backup to their innate suspicion. Most keenly affected, however, is the repressed Head Center’s solicitude—specifically the uneasiness of their anxious minds. Type Seven: Typically, the gluttony of type Seven is described as a form of overconsuming pleasurable options and opportunities as a way to distract those dominant in type Seven from facing their own inner pain or suffering. This Passion, once trigged, opens up a voracious appetite for experience, connection, and imagination. 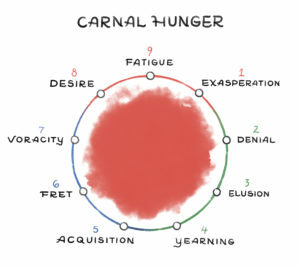 The Seven’s inability to experience satiety, or being incapable of satisfaction, is the painful idealism of insatiability that characterizes the Seven’s emotional ache. Their repressed Heart Center—and the fact that Sevens don’t have a natural wing or Inner Flow path to their Heart Center—fuels this insatiation with very little responsibility to moderate it. Their voracious insatiability is wasted on the present. However, clever and savvy problem solvers, the Seven remains preoccupied, immersed in the daydream of what will voraciously consume their obsessions and fascinations next. Type Eight: Lust is a phrase that many Eights, even those who don’t suppress or repress their sensuality and sexuality, experience as too personal of a descriptor to publically identify with. The usual clarification that “lust in this case is more of a lust for intensity” helps, but this still doesn’t describe what is experienced by those dominant in type Eight. As the Passion is held in the body, it can be understood as the intensity of desire that grows and builds within, fueled by the frustration of its too-muchness. Having repressed their Heart Center, this desire is often unintegrated and unreconciled and so becomes unaccountable in its excessiveness or the overabundant surplus of energy that it produces. Though quick-thinking, the impulsive lack of reasoning regarding the consequences of excessive desire gives the Eight’s lust more power than would ever be rationally intended. This creates the ensuing quandaries many Eights manufacture for themselves and others. Type Nine: Proclaiming sloth as the Nine’s Passion can certainly be a blow to the composed, natural amicability of those dominant in type Nine. The forgotten Body Center for those dominant in Type Nine is less lifeless or lazy and more fatigued. Nines dispense a great deal of energy in their projection of the fragmentation of their inner lives in the proxy battles they arbitrate for their external lives. Often misunderstood as complacent (as if Nines are pleased with themselves) or apathetic (disinterested or unconcerned), Nines can quickly become worn out from projecting what has exhausted them internally. This exhaustion leads to an emotional lethargy that takes over their hearts and is experienced as lassitude or a strong sensitivity to their weariness. Exhausted from carrying unremitting fatigue in their bodies and a tender languor in their hearts, Nines let their mind detach into a state of numbness to cope with all that overwhelms them. Needless to say, there’s an urgent need to tighten the nuance of each of the nine Passions as they are wrapped around the color wheel of human character structure. 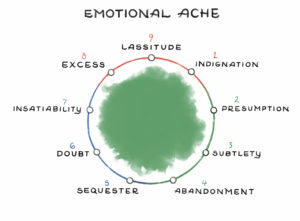 As complex and sophisticated as the Enneagram’s Passions are, the elaborateness of these emotional distresses requires thoughtful distinction to avoid the common caricatures one comes across. Chris Heuertz, founding partner of Gravity, a Center for Contemplative Activism, has trained under some of the great living Enneagram masters including Father Richard Rohr, Russ Hudson, Marion Gilbert, and Helen Palmer. Today he leads Enneagram workshops all over the world. He is the author of several books, including The Sacred Enneagram: Finding Your Unique Path to Spiritual Growth. Join Chris as he shows you how this ancient tool can help you awaken to the gifts God has given you, find freedom from your personal patterns of sin and fear, and grow in acceptance of your identity as you grow with God. Illustrations by Elnora Turner; do not use without permission. Jack Labanauskas and Antonio Barbato have done some of the best work in this area. See: “Inner Polarities: The Structure of Passion.” Enneagram Monthly (March 2000, Issue 59): pages 1, 18-20. Claudio Naranjo, The Enneagram of Society: Healing the Soul to Heal the World (Nevada City, CA: Gateways Books and Tapes, 2004), 22. Author of Travels with Odysseus, the groundbreaking work that suggests the Enneagram shows up in Homer’s The Odyssey. Coincidentally, I also see a triad of how the Fixations are experienced by each of the Intelligence Centers. *NOTE: This article originally appeared in Enneagram Monthly issue 238 (April 2018), pages 1, 20-22, and is reposted here with permission from the editor. To subscribe to Enneagram Monthly visit their website.